Arthritic pains, rheumatism, enhance circulation of blood, relieve muscular fatigues, to lift swelling and stop pain, muscular stiffness of hands and legs. Symptoms include chronic weak lower back, weakness and pain of the waist and knees, and muscle stiffness. 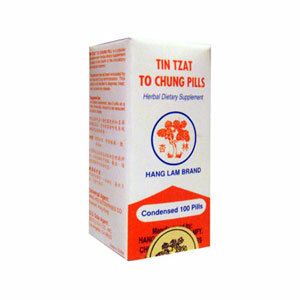 Tin Tzat To Chung Pill is a popular and well-known herbal dietary supplement useful in the health of the circulatory and muscular systems. This product is for arthritis, muscular pains, muscular stiffness, and all types of rheumatism, lower back rheumatism due to kidney deficiency. It relies on tonics as well as invigorating herbs, and is useful for aging patients. Notoginseng moves blood as well as tonifies it, Eucommia strengthens the lower back, and Schisandra astringes the formula to the kidney region. Tonifies kidney yang, dispels and wind and eliminates damp, tonifies Qi and blood, nourishes kidney yin, invigorates blood. Use for weak lower back due to underlying deficiency of kidney Qi and yang. Arthritic pains, rheumatisms, enhance circulation of blood, relieve muscular fatigues, to lift swelling and stop pain, muscular stiffness of hands and legs. Symptoms include chronic weak lower back, weakness and pain of the waist and knees, and muscle stiffness. Adults, take 5 pills, 4 times a day. Amount to be reduced by half for children.